Things move quickly in the business world. 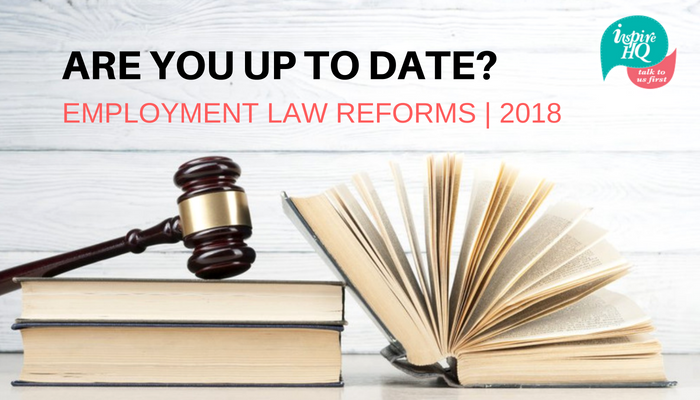 New employment laws are constantly emerging or are reformed, and keeping up to date can be tricky. We have already seen a number of law reforms this year and we are shaping up to have more in the coming months. Staying on top of these changes is essential to ensuring your business remains compliant. To help you keep up to date, we are going to look at three recent legislative changes and help get you ready for some upcoming changes you need to be aware of. We recommend that employers keep a record of how and when FWIS are provided to each new employee. The new Notifiable Data Breach scheme came into effect from 22nd February 2018. This scheme amends the Privacy Act 1988 (Cth) to introduce mandatory “eligible data breach” notification provisions. If your turnover is more than $3 million per year and you are governed by the Privacy Act 1998 (Cth. ), or if you are a smaller business handling sensitive or personal information, then this new legislation can impact your business. [ii]This new law means that businesses who discover they have been breached, or who have lost data, will need to report the incident to the Office of the Australian Information Commissioner (OAIC) Privacy Commissioner, as well as notifying affected customers as soon as they become aware of the breach. Failing to report a data breach, can lead to fines of up to $360,000 for an individual and $1.8 million for businesses. In Claire’s latest blog “How to tell if your Wages are Compliant” she details how you can stay compliant, the components of a basic wage and how to keep up to date and navigate the award interpretations. Here are a couple of upcoming future reforms that you will need to be aware of. On 6 July 2018, a Full Bench of the Fair Work Commission (FWC) handed down a decision finalising the content of a model award clause for up to five days per year of unpaid leave to deal with family and domestic violence. The clause will be inserted into all modern awards. The FWC intends to issue determinations varying each award, with an operative date of 1 August 2018. We urge all businesses to ensure you are up to date on your obligations, by using the wide range of free resources available on the Fair Work website and/or to seek advice from HR experts, such as Inspire HQ. Caleb is a Human Resources Graduate who works with Inspire HQ to help deliver high quality and professional HR & Recruitment services. His friendly, helpful and approachable style tailored with his can-do attitude will help you and your business achieve the best outcomes possible. He holds a Bachelor of Business in Human Resources from Federation University Australia.